Your living spaces, the environments where you spend your time, impact greatly how you perceive and feel about yourself and your future. The interior décor of your home reflects your present thinking and the level of trust in the direction of your life. The elements that compose your living spaces send an important message that can elevate your sense of being into what is possible or keep on showing past accomplishments, memories, etc. Since we are all connected, everything is energy, the furniture and elements with which you share your life can be designed to actively elevate your happiness and love levels, to inspire how you feel and how you think. Simple adjustments to your living spaces can improve your life and bring about inspiring qualities and expanded interest. 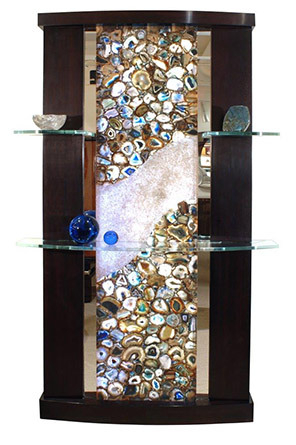 Perczek Design uses a collection of exotic finishes and energy infused materials, high frequency elements - like natural quartz, sea shells and gem stones, that can transform your home environment to a positive reflection of your inner essence and empower your life's purpose. 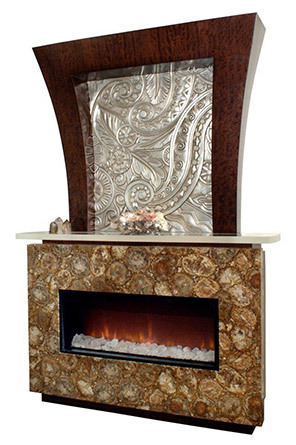 Perczek designs furniture and illuminated interior panels with natural crystals and natural shells that have unique healing properties based on their vibration and colors. "Everything we surround ourselves with — our furniture, our artwork, the layout and flow of our space — reflects, contributes to and influences our own energy," Jaime says. He pauses and his eyes close momentarily, as if allowing his mind to weave a vision of the space that perfectly complements his clients' personal styles and energies. Breathing deeply, he smiles, opens his eyes, and continues: "When in balance, it inspires our desire to create harmony with the outer world. The energy of our surroundings is elevated and thus we feel peaceful, we feel happy." Metaphysically we are all connected. Our world's vibration and energy influence every aspect of our experience. Our thoughts and emotions attract and blend with other like vibrations and frequencies. Every person we encounter gets the benefit of our elevated energy and that energy exponentially goes out to affect others around the world. As you can see, it all starts with a positive investment in ourselves. For over 30 years, Jaime Perczek has worked with a discerning clientele to create interior spaces and one-of-a-kind furniture pieces that transcend beyond "beautiful to enlightened." His revolutionary approach to interior design and space planning carefully evaluates the client's inner desires to translate them into shapes, colors and elements aligned with the client's inner desire and vision. Our revolutionary approach to interior and custom furniture design continues to elevate Jaime Perczek Design beyond the traditional and keeps us continuously sought-after by clients who are ready to take their personal space and daily lives to a higher level.